One of the key questions for a small country is how to interact with neighboring countries. With its eight and a half million consumers, the Swiss sales market is (too) small, so it is all the more important to have access to foreign consumers. For example, pharmaceutical company Novartis generates just 2 percent of its sales in the Swiss market. Switzerland's largest trading partner by far is the European Union, where the country exports more than half of goods (compared to 15 percent for the US and 5 percent for China). 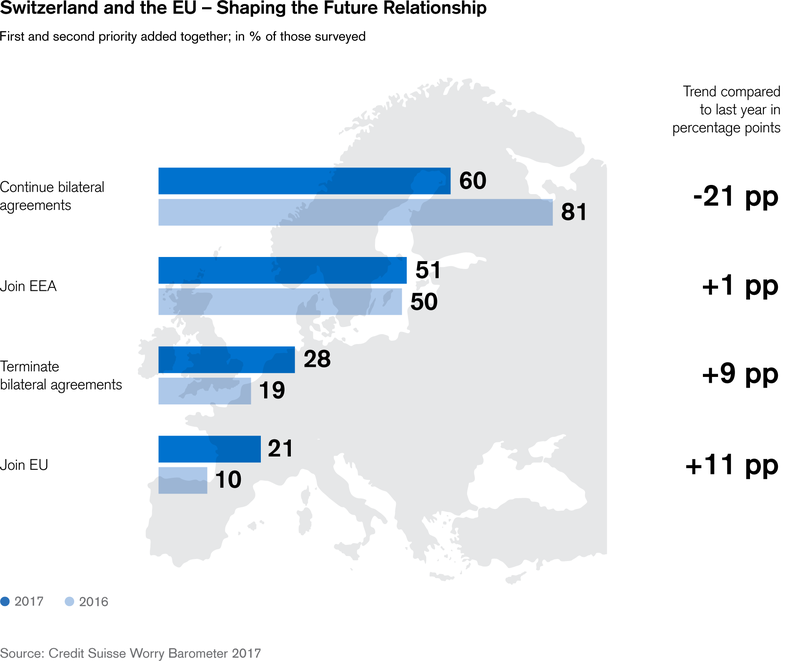 Asked what kind of relationship the respondents would like to have with the EU as a first or second priority, 60 percent said they support a continuation of the bilateral agreements. This figure increased sharply last year (to 81 percent), perhaps in response to the discussion about implementation of the mass immigration initiative. The current figure is similar to 2014 (66 percent) and 2015 (60 percent). So the status quo is broadly supported. At the same time, it is interesting to note that more than one in four respondents would like to end the agreements. And the preference for accession to the EEA, which would even scrape a 51 percent majority vote, is even higher when both first and second priorities are taken into account. So from the point of view of the respondents, there is an alternative to the bilateral agreements. There would be no chance of accession to the EU, however, which is supported by only 21 percent of respondents. A gap opens up between the government and the people when they are asked how Swiss politicians behave toward other countries (increasingly aggressively) and how they should behave (more defensively). Perhaps this is because those surveyed believe that Switzerland's image abroad has continuously improved over the last few years and they do not want brash behavior to jeopardize the good reputation that Switzerland now enjoys. The Swiss are extremely proud of their country and their new national identity is closely linked with a global world – so good relationships with the country's neighbors are all the more important, and nothing should be done to jeopardize them.